The legendary H.P. Lovecraft originally wrote the story behind this film back in 1922, as part of a serial entitled "Herbert West: Re-Animator." Sixty three years later, director Stuart Gordon and screenwriter Dennis Paoli used over twenty five gallons of fake blood and a lot of creative writing to bring it to the big screen, the results were astounding. Now, twenty five years after the film's release, it remains one of the most celebrated horror films of all time. 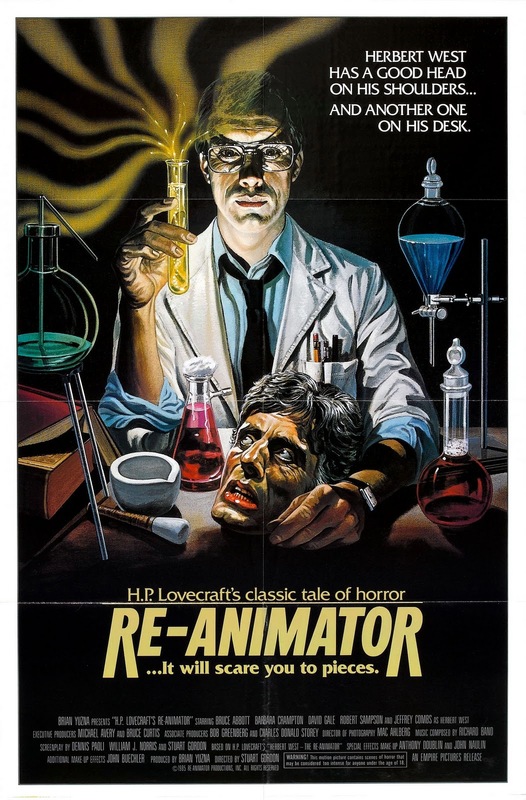 It is with that in mind that we bring you the retro-review of: Re-Animator! Cult horror icon Jeffery Combs plays Herbert West, a brilliant, albeit slightly deranged medical student who transfers to Miskatonic University in Arkham, Massachusetts. He soon involves his fellow medical student Dan Cain (Bruce Abbot) in his extracurricular experiments. West has developed a serum that will bring dead tissue back to life. Cain’s dead cat becomes a subject for West as he decides to involve Cain in hopes of legitimizing his work with the University. Cain is one of the most promising students (not to mention dating the Dean’s daughter) so West thinks his connections will be helpful. In the meantime, Dr. Hill (David Gale), who has a reputation for stealing the work of others and using it for his own gain, finds out about the serum and attempts to take it for his own. Dr. Hill is well on his way to succeeding when West manages to cut off Hill’s head. This would slow down most villains, but not Dr. Hill, since West decides to try his serum on him. Of course, if he was just a head he wouldn’t be able to do much, but West, trying to see if the serum will work on body parts as well, decides to reanimate Dr. Hill’s body too. Now Dr. Hill’s head uses his own detached body to escape and take the serum with him. The result is a kidnapped Dean’s daughter used to satisfy Dr. Hill’s demented desires, which made for arguably one of the weirdest scenes ever featured in a horror film (if you've seen it, you know exactly what I'm talking about). All of this (and a whole lot more of course) leads to a very creepy and haunting ending that leaves the audience wondering what happens next. Anchor Bay Entertainment released the latest edition of the DVD in a special 2-disc set complete with a neon green highlighter in the shape of a syringe and a literal ton of extras. The first disc features a first-class digitally re-mastered unrated version of the film, along with two separate audio commentary tracks. The bonus disc features several interviews, extended/deleted scenes, trailers/TV spots, galleries; lots of behind-the-scenes stuff and most notably, an all-new 70-minute documentary entitled "Re-Animator Resurrectus". As if that weren't more than enough, it also features a DVD-ROM with the original screenplay and a digital copy of H.P. Lovecraft's "Herbert West: Re-Animator".